The 139th running of the $2 million Kentucky Derby (G1) Presented by Yum! Brands saw one of the most contentious fields in recent history. Just 151,616 fans, the 9th largest attendance on record, crammed into Churchill Downs on Saturday. Undoubtedly the soggy conditions, with steady rain all afternoon and temperatures in the low 60's, greatly reduced the walk-up crowd, with the infield not as crowded as in most years. After Black Onyx scratched on Friday, just 19 went to post in this 1 1/4 mile classic beneath the famous Twin Spires. Orb was sent off as the 5-1 favorite for trainer Shug McGaughey, exiting wins in the Florida Derby (G1) and Fountain of Youth (G2) both at Gulfstream Park. In to challenge him included 6-1 second choice Revolutionary, winner of the Louisiana Derby (G2) at Fair Grounds and the Withers (G3) at Aqueduct, 7-1 third choice Goldencents, winner of the Santa Anita Derby (G1), and 8-1 fourth choice Verrazano, undefeated in 4 starts including the Wood Memorial (G1) at Aqueduct and the Tampa Bay Derby (G2), but was unraced as a juvenile. Orb leads down the stretch while chased by Golden Soul on the outside and Revolutionary on the rail. When the gate opened at 6:33pm, jockey Mike Smith sent 24-1 Palace Malice to the front and he set a a blistering pace over the sloppy, sealed track through fractions of 22.57, 45.33, and 1:09.80 while as many as 3 1/2 lengths ahead of Verrazano and 25-1 Oxbow who stalked him for the first 3/4 mile. On the far turn, Palace Malice tired from the fast pace, which set the race up for the closers. 9-1 Normandy Invasion, who raced 7th about 8 lengths off the early pace, moved up to take the lead at the top of the stretch, getting the mile in 1:36.16. Normandy Invasion led to the 1/8 pole but was tiring fast. Jockey Joel Rosario kept favorite Orb out of trouble in 16th some 18 lengths off the pace early, but circled the field entering the lane to take over the lead just inside the 1/8 pole and won going away by 2 1/2 lengths over late-running 34-1 Golden Soul in 2:02.89. It was another length back to another closer, Revolutionary, third. Verrazano, who was up close early, faded late to check in 14th beaten 15 3/4 lengths, while Goldencents was through after a mile and was eased by jockey Kevin Krigger, officially finishing 17th beaten 49 1/2 lengths. Left: Orb with his Derby roses. 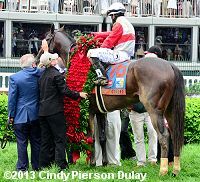 Co-owner Ogden Mills "Dinny" Phipps said, "I think it's terrific, absolutely wonderful.� It's really the culmination of horse racing, and I am thrilled to be here today. I started coming around here in 1957 with my grandmother when she had Bold Ruler." Co-owner Stuart Janney added, "This horse's bloodline goes back to our grandmother, and Dinny's father was very instrumental in getting me to take over my parents' horses 20 some years ago. And so I just couldn't be more delighted that we're doing this together. I remember when Shug was inducted into the Hall of Fame that he said at the end of his speech, I really would like to win a Kentucky Derby for Stuart or Dinny, and I thought, well, that's a good sign because we don't want him laying down after he gets in the Hall of Fame. But I think he's been very smart to pick one of the horses in the barn that the two of us own together so he doesn't have to worry about that particular promise with one disappointed owner and one very happy owner. " Right: Orb heads back to the barn with his new winner's blanket. Trainer Shug McGaughey, celebrating his first Kentucky Derby win, said, "Obviously it's a huge, huge thrill for me. It's a race I've always wanted to win, a race I've always wanted to compete in if I thought I had the right horse, and finally today we had the right horse. I don't know what it will be like tomorrow morning when I pinch myself and figure all this out, but there's a lot of people to thank and I'm just the guy that pushed the button, but with Stuart and Dinny and the people in my barn, put so much time and pride into Orb as well as all the rest of them, they're the real key, and like I say, I'm the lucky one that gets the accolades and the trophy." Left: Trainer Shug McGaughey leads Orb before he gets his roses. McGaughey said, "I said to myself when this all got in the process, that I was going to go over there and have fun, and I've been excited. I was excited today a lot more than being nervous, and I did think I had the right horse. He'd done everything well. He did everything well all winter. We shipped him up here, all that went well. He seemed to get over the track. Every day we trained him, he got over the track good. He had a great workout here on Monday and he was terrific in the paddock today and post parade and going in the gate, and so when they swung the latch, I thought to myself, just enjoy the race. If it works, it works, if it doesn't, it doesn't. Luckily it did work today. The way it's going to change my life is I'm not going to have to worry about it anymore, because I've worried about it for a while. And I might not let anybody know that, but inside that thought was always there." 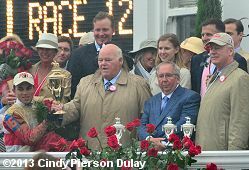 Right: The trophy presentation with Joel Rosario, Dinny Phipps, Shug McGaughey, and Stuart Janney from left to right. 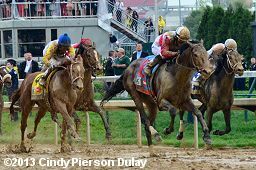 Co-owner Stuart Janney said, "Well, obviously these are very important races, and the Preakness is important to me. I grew up around it, went there all the time. So if Orb is doing well, comes out, as Shug says, then obviously that's the next stop. So that's great as far as I'm concerned. We thought years ago that we had Coronado's Quest all geared to go to Baltimore, and unfortunately a day before hand he decided he wanted to be lame for about 6 hours. So I think if Orb is right, then we'll probably be there." Left: Orb in the post parade. 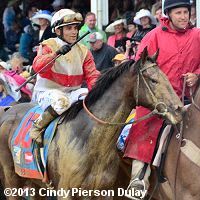 Jockey Joel Rosario, celebrating his first Derby win, said, "To me it means a lot. I'm very happy for Shug, you know, than for myself. I had a perfect trip. He was really calm, very relaxed, and I think Shug did a really good job with him. Sometimes he can be a little handful but he was perfect today. With me and my agent and Shug, we talked about it, try to save the ground the first turn, and then after that Shug said he's probably better to be on the outside. Hopefully they were not pushing me wide. When I brought him over, I know he's the kind of horse that keeps going, and I can see he can catch the horse in front really quick. As soon as I passed the last horse sometimes he likes to pull himself a little bit so I kind of get after him a little bit, and he was going along well." Right: Joel Rosario celebrates after the race. He said, "I remember watching Funny Cide when he won the Kentucky Derby, Jose Santos. This race is really special. You can see all these people, I mean, it's something really unbelievable to see. Like right now I feel like I win the Kentucky Derby, it's like a dream. I feel so good right now, I can't explain to you how I feel." 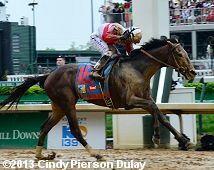 First time by in the 2013 Kentucky Derby. Mike Smith aboard pacesetter Palace Malice said, "He just was too aggressive. Those blinkers. He just wanted to go and I didn't have much choice." Left: Second place finisher Golden Soul in the post parade. Jockey Robby Albarado said, "It was great. I thought I had a great chance turning for home.� I saw Orb up there. I'm just thankful for the opportunity. It's amazing to get the opportunity. It was stop and go. I was comfortable with the pace. Stop and go just a couple times. I got a great inside trip. I got him out. He came running." 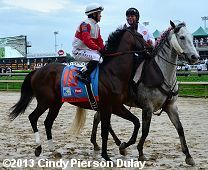 Trainer Dallas Stewart added, "We got beat by a great horse. He ran terrific. I'm so proud of Robby. He vindicated himself. He's just a great rider and gave this horse a great ride. And (owner) Chuck Fipke, what can I say? One of the best ever." Right: Third place finisher Revolutionary walks over to the paddock before the race. Trainer Todd Pletcher said, "I thought he ran super. He got shuffled back farther than we thought and he had to keep waiting to try to make up ground. But when he could start running, he did really well. He closed strongly and just ran out of ground." 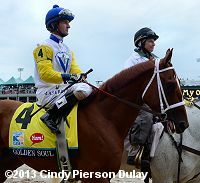 Jockey Calvin Borel added, "The only thing I was I could have done on the far turn was creep up closer on him. Turning for home, I still thought we had a shot to win but he gave me a good turn of foot."